This apartment is situated in a former farmhouse. It has a large front garden with linden trees, cypresses, oak trees and conifers. 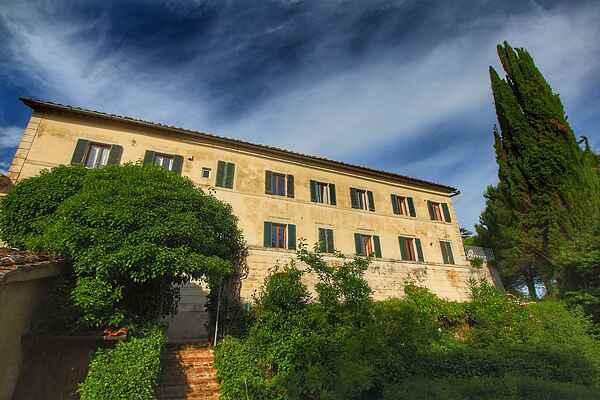 The swimming pool enjoys a stunning setting among olive trees and offers amazing views of Siena. The owner lives in the stone farmhouse adjacent to the white villa and would be more than happy to tell you about interesting sights in the area. You'll be sharing the swimming pool with any other guests that might be staying in the other two apartments. Your accommodation enjoys a hilltop location in the village of Tolfe, only 3km from Siena. This location in the heart of Tuscany means you'll be able to reach many important art cities such as Florence, Arezzo, Pisa, Lucca and Perugia within an hour's drive.